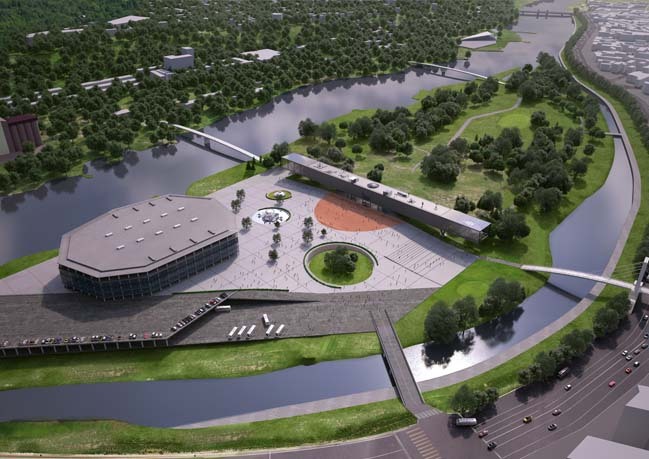 Science Museum is an architectural design of the National Science and Innovation Centre of Lithuania by Architects of Invention to create a marked but porous division between a newly created urban environment and existing parklands. 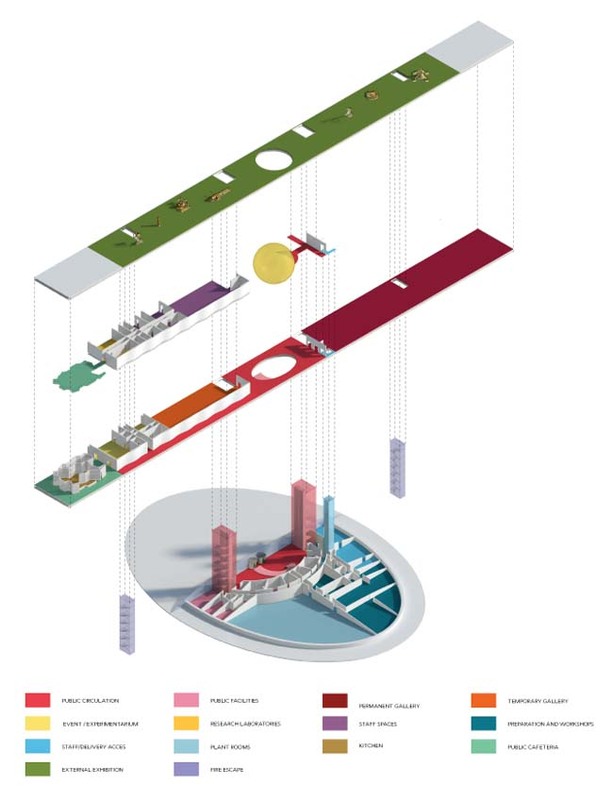 Project's description: In keeping with the Science Centre's emphasis on environmental matters, this design provides a natural barrier across the island to preserve the purity of the park. 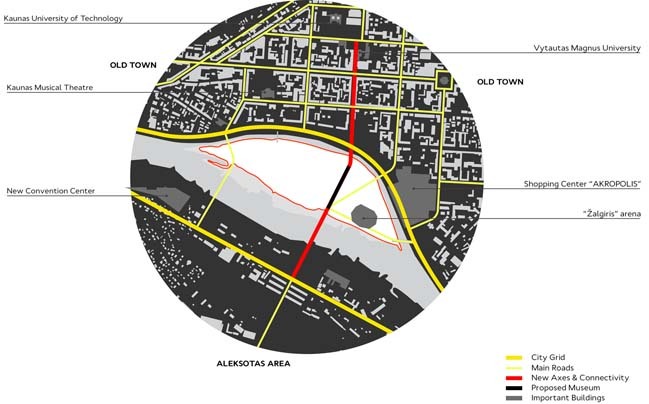 The orientation of the building allows for a fluency of movement via bridges – the existing pedestrian bridge and a new south-bank bridge – connecting the island to the old-town and expected future developments in South Kaunas. To minimise car traffic, we have kept the Science Centre as close to the Žalgiris Arena as possible. Since most visitors to Žalgiris Arena arrive in the evening from 20h, we propose that this existing car park be available to Science Centre visitors during its daytime opening hours. Deliveries will be restricted to the East side of the island. The building’s main principle is to divide the island into two parts – the landscape and the hardscape. The balancing building concept was conceived as a subtle intervention into the terrain, and acts as an abstract rectilinear sculptural object. It allows Science Centre curators to make use of both the paved, constructed side of the island and the natural side. 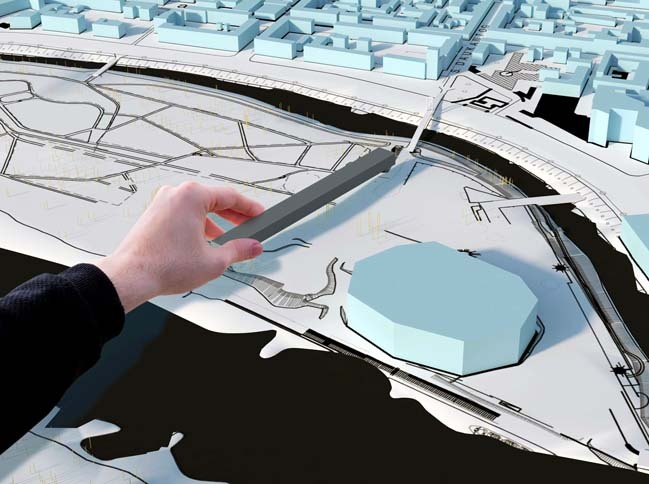 The building acts to soften the bulky effect of the Arena structure, to integrate it more subtly into the island space. 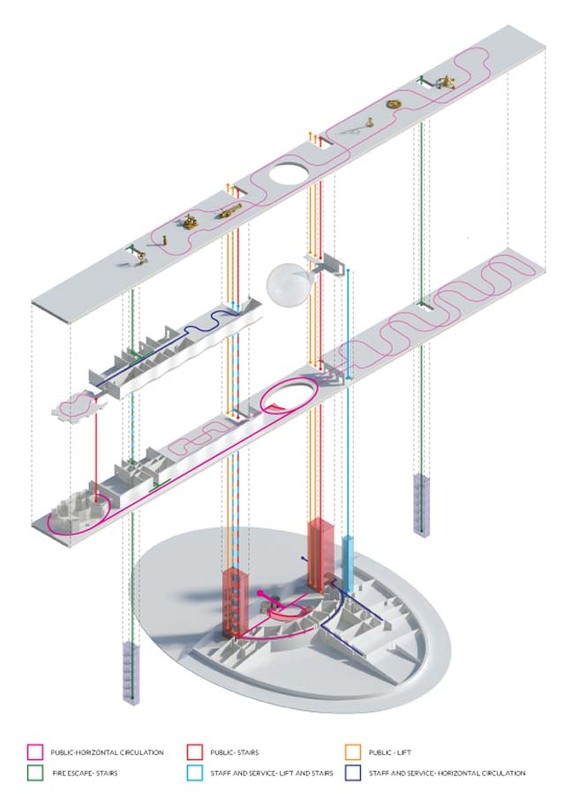 As a linear volume, the structure maximises possibilities for navigation and exhibition. As a feat of engineering, the balancing building captures the spirit of experiment, and reminds us of scientific apparatus. The public spaces of this building are singular open space volumes. 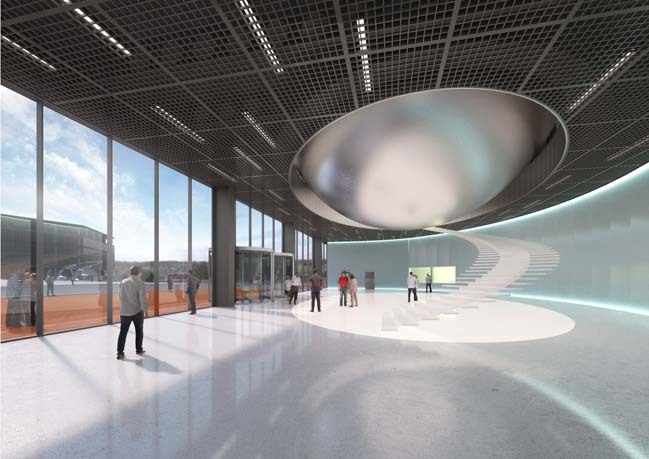 The main entrance hall is arched with a spherical planetarium suspended overhead. The south hall is a double-height open space for large-scale exhibition. The café is positioned with a view onto the old-town, indeed the ends of the building are designed to be increasingly transparent to interact with the surrounding landscape. The varying quality of light, from its glass extremities through to the opaque central section of this steel-structured building provide a range of illumination for curatorial consideration. The gallery spaces in this balancing building are designed for maximum flexibility. That is, in their simple rectilinear expanses, they can be manipulated for a wide variety of curatorial configuration. The balancing building is 250 metres long and is at the structure’s mid-point; the main entrance faces the plaza, and another entrance faces the park at Level 1. The central hall contains an information centre, cloakroom and shop. Circulation through the building is linear, allowing easy for navigation by visitors. There are four fire escape routes, located every 50 metres along the length of the building. There are dedicated staircase and lifts for staff, located to the side of the main entrance. The back of house functions are positioned in the hill, so deliveries are organised via the existing road behind the Arena. 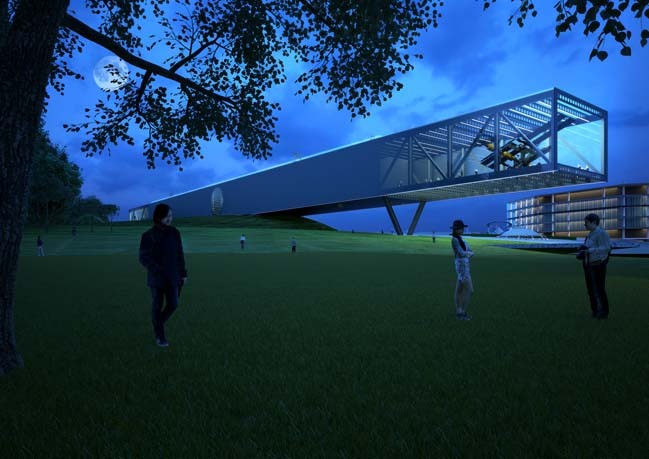 The proposed architectural form demands a dramatic structural response so as to produce long-span cantilevers which appear to float without any structural support. The box element of the form is utilised on the two longitudinal sides by incorporating mega trusses which start to describe the form as a long spanning bridge. The transverse section is framed as a moment frame U section allowing the deflection of the section under wide to the sides to be controlled. All the key structural forms would not be possible without the use of a high strength material and in this case structural steel fabricated into relevant box sections and beams sections is the best response. The transverse steel beams are formed with cellular openings to allowing coordination of MEP services. 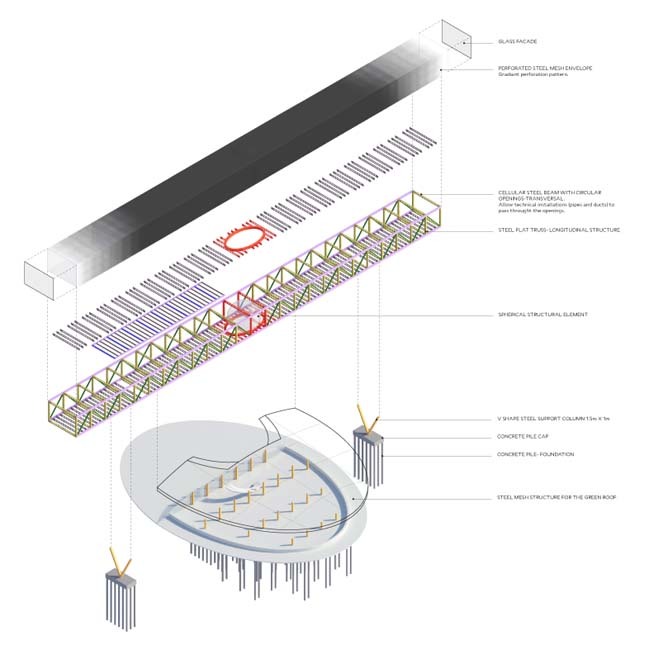 The building is approximately 250m long and hence requires bridge bearings at the first internal support points so as to allow the building to expand and contract from the fixed central point. 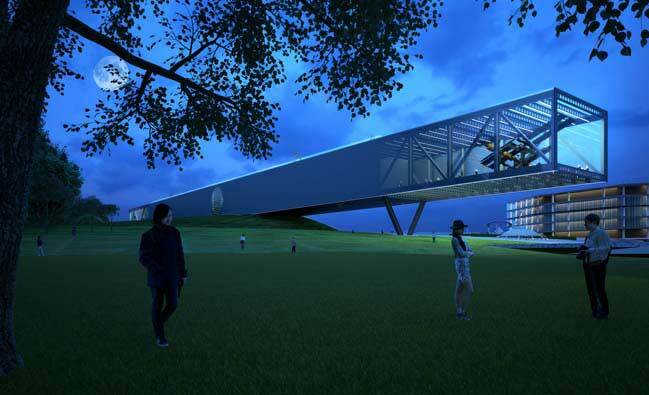 This makes the building monolithic and without movement joints in structure or fabric. Given the fluvial nature of the river deposits a piled system is proposed for foundation support so as to control settlements. A bored cost in situ concrete piling system is preferred so as to core through any larger stone deposits in the ground. Low Level Air Distribution: maximises the use of 100% outside air; ideal comfort level for occupiers; low running cost and maintenance. 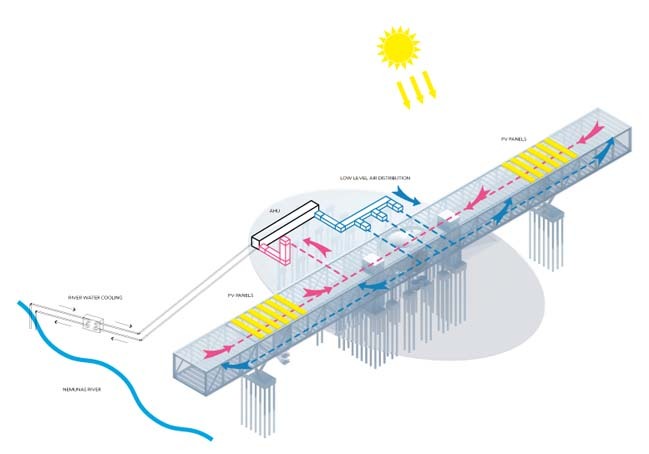 River Water Cooling: utilises river to cool the building and eliminate air source cooling. Photovoltaic: electric power generation by integrated PV panels in the façade. LEED Certification: high efficiency lighting; day-light use; lighting control.